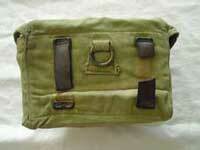 The Mark I Carrier was comprised two adjustable loops, with a distance piece and the strap ends extended into a “tail”. Each strap had a Slide brass, carrier, great coat, 2-in. stitched to one end. The strapping was led through the one loop of the distance piece (made from the same Web, cotton, drab, 2-in.) and around the central bar of a “swinging bar” buckle called a Clip, brass, carrier, great coat, (Mark I.). From there it was doubled back under the rear bar of the Clip, through the distance piece loop and then the Slide. The running end was then threaded through the opposite side of the Clip, between its forward bar and the “swinging bar” underneath it, which trapped it when the strap was kept under tension. The end of the strap was doubled back and folded, origami fashion into a point. A Hook, brass, carrier, great coat. (Mark I.). protruded through the point. This was actually an oversized dressmaker’s hook, made of doubled heavy gauge brass wire, whose two loops were contained within the folded tip. To complete the Carrier, a web chape holding a Loop, brass, 1-in. was stitched centrally on the distance piece. A short captive strap made of Web, cotton, drab, 1-in. was stitched to be adjustable through a Slide, brass, 1-in. The end was doubled back, folded to a point and finished with a Hook, as with the front straps. The Mark. I was superseded by the Mark. II when List of Changes entry §12471 was issued on 26th October 1904. The major difference was the doubled portion of the strap was now against the wearer’s back. The Slide remained, but the Clip (Mark I.) changed to a Clip, brass, carrier, great coat. (Mark II. ), which provided a far more positive clamping force. It comprised a slide, with drilled lugs on one of its bars. Pivoted between the lugs was a toothed bar, which had an open triangular “lever”at right angles to it. With the “lever” raised, the strap could run freely, but once the lever was pushed flat over the slide frame, the strap was firmly clamped. the Mark I Hooks changed to Hooks, brass, Mark II, long bar on the front straps and a Hook, brass Mark II, short bar on the rear adjustable straps. These were solid hooks and the “bar” elements were hidden by the folded ends, the hook protruding through the webbing. In both versions, the hooks on the front two straps attach to the Loops, brass, 1 1/8 in. on the Mark I Cartridge Pockets, or the Loops, brass, 11/16 in. x 9/16 in. on the Pockets, cartridge, 15 rounds (Mark II.) and the small central hook at the back attaches to the loop on the rear of the Cover, mess-tin, D.S., Bandolier Equipment, Patt. ‘03. 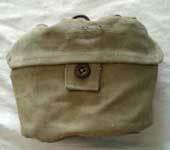 The greatcoat is folded into a rectangle 15-inches wide by 9-inches tall, secured with the Straps, great coat, then inserted into the loops at the rear of the Greatcoat carrier. This example, from the Karkee Web Collection, is maker marked "PRICE & CO. / LONDON" and dated 1906. The Bandolier Equipment Pattern 1903 Mess tin cover, dismounted men, Mark II was entered into the List of Changes with the Pattern 1903 Bandolier Equipment by List of Changes entry §12389, dated 20th October 1903. According to this L. of C. entry, the previous Mk. I version was never entered into the List of Changes. This example has the round brass ring and leather belt straps prescribed in the L. of C., but is made of a light cotton muslin instead of canvas. It is not maker marked or dated, but is marked "RAOC 96" on the inside. From the Karkee Web Collection. 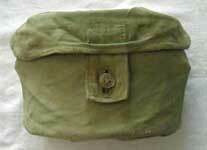 Examples of the the Mess tin cover exhibit considerable variation in detail. 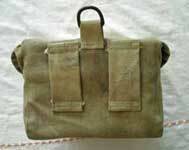 This late issue example is made of heavy flax canvas, with canvas rear straps and a brass dee replacing the loop. It is maker marked "G SCHNEIDERS & SONS / LONDON" and dated 1918. From the Karkee Web Collection.